My sound packs have been constantly improved and there are now at the best possible quality. 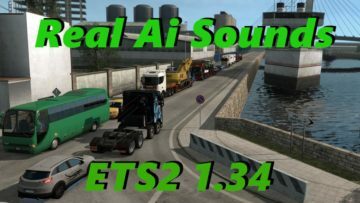 my packs may include sometimes sounds from Sound Fixes pack by Drive Safely that I adopted in my mod when he removed Ai traffic support in 1.32. credits and special thanks to Drive Safely for his sound horns but also a few engine sounds, some reworked. – Ai spawn: most of the traffic packs are still using old fashioned spawn rules in country folders. spawn_ratio can now be set in Ai sii files and I added this for some packs (sport, motorcycles), however country traffic files have priority so in order to use my increased ratio you shall remove def/country folder from the traffic packs that you use.